How to improve the import process (on the Mac, that is). Why does it need improving? I’m glad you asked. With Lightroom CC, pictures aren’t “touched” on import anymore: They don’t get converted to .dng and aren’t renamed, as was the case with the “old” Lightroom. Why do I care? Isn’t Creative Cloud the only true and relevant source anyway? Yes, kinda. But when exporting a file in Lr CC, the format is still relevant. Lr CC offers the option to export an original with edits. If I didn’t convert the files on import, I’d end up with an .orf (the name of Olympus’ RAW format) file – with an ugly .xmp sidecar file containing Lr’s edit information. Yuck. If you work with .dng files, the edits get baked into the file, so there’s no extra .xmp file. Bliss. Next up, file names. While this may show my pathological sense of order, I care about file names. My camera uses continuous naming scheme for photos. Dealing with that is a non starter. Like any sane person, I work with my photos in Lr or some other library software only. And there’s always metadata, so the file names aren’t that relevant. But a naming scheme that reflects the date a photo was taken is a good fallback, and simply reassuring to me. When it comes to backups, sync etc. being able to look at the file and knowing the creation date just makes sense and is something I don’t want to miss. Here’s how I solved these problems. I wrote two bash scripts. One grabs the .orf files from the SD card, copies and converts them. I execute it manually via Alfred. The other one renames the files, I execute it manually like an animal as well, after the import and conversion script is done. If you don’t use Alfred: With Apple’s Automator.app, it’s easy to make these scripts easily executable as a system service, or even “apps”. I couldn’t for the life of me figure out a non-hacky way to string these two together, that’s why I execute them manually (If you know how, let me know!). This script uses Adobe’s own, standalone DNG converter. Yes, there is such a thing. To work for you as well, the script needs a little adjusting: The paths to a) a temp folder for storing the .dng files (which the second script will need), b) your SD card (when it’s inserted and mounted of course). Then, c) you only need to turn the .orf into whatever your camera brand’s RAW format name is, so that the script grabs those files. This script uses EXIFtool to rename files, ant then moves them to another folder, just for a sense of order. It took me a long time to find the darn 4c option (for ascending numeration) in EXIFtool, but in the end I did. This script uses a yyyymmdd-#### scheme for renaming. So the first picture I take on chrismas eve 2018 is named 20181224-0001.dng. The script also strips any comment from the description tag your camera might have put there (My Olympus is obnixious like that). Get EXIFtool if you don’t already have, adjust folders as neccessary and naming to your liking and you’re all set. I hope this is helpful. Feedback is very welcome! Cheers. Anchor CTO Nir Zicherman wrote on medium that You Should Never Pay For Podcast Hosting. I find this quite dishonest. Here’s why. Anchor, let’s call them a “podcast startup”, is VC-backed, but ultimately wants to make money… probably by selling ads. On the face of it, there’s nothing wrong with that. Probably the majority of podcasts I listen to are ad-supported or ad-financed, and I find that makes for quite an honest and sustainable transaction. So, why am I so antsy when it comes to Anchor? Because they are going to inject themselves in between you as a podcaster and your audience, serving ads. While podcasts “hosted” on Anchor are real podcasts in the sense that they have an RSS feed and can be subscribed to in any podcast app, they push features like Voice messages and Applause. They also call themselves a podcast platform. I bet it’s not long before Anchor reminds you that “Anchor Podcasts” are “best experienced in the Anchor App”. Jason Snell pointed out YouTube as an example of how something like that might look like (as well as its dangers). I’d go a step further and point to Facebook’s Instagram and Twitter, both at various stages of struggling with, or failing at making money from ads without annoying their users. This is critical: Once your podcast host (= a relative straightforward website/filehost) becomes a platform with that kind of business model, you and your podcast have a big problem as soon as the monetization doesn’t quite work out as planned. Everything that gives me pause about Anchor is amplified by the messaging. It is one thing to advertise what you think you’re good at, or point out a low price. But calling a straightforward hosting service an “outdated business model”, proclaiming that one’s “singular mission” is to “democratize audio”, right after not answering the question what your business model is, all with the goal of inflating a VC-financed bubble – that is just Grade A BS. The post is even oversimplified to the degree that Anchor’s team apparently doesn’t need a salary – lucky them. All of this to sell you on Anchor being free free FREE, compared to other beginner plans that are 10 whopping bucks and make you an actual independent podcaster? Get.a.grip. Another thing puzzles me. Anchor emphasizes wanting to lower the barrier to podcasting as well as making it generally easy to start one. Alright, that’s applaudable. But this doesn’t lend itself well to content from experienced podcasters/producers – regardless of the fact that they’d be unwilling to sign away their content anyway (read “License Grant”). With just a slight exaggeration to illustrate my point, despite the danger of sounding like a cranky old, and without meaning offense: A whole bunch of people’s first 10 podcast episodes, recorded with their iPhones may not be the best that podcasting has to offer – as well as the best for creating ad revenue. Let me explicitly say that I am in total support of lowering barriers to entry wherever possible. I find joy in explaining first (or advanced) steps in some of my hobbies (photography, podcasting), and I think that the democratization of tools for creation in our digital age is a beautiful thing. So I don’t argue against the part where Anchor competes by offering simple tools for creating audio, or distribution. But looking at Twitter right now, and how Instagram has influenced photography, I just have to hope that Anchor doesn’t catch on. I record a podcast with a friend, in a room of my flat. My setup and preferences are derived from that, so ymmv as they say. Disclaimer: Since I’m not a pro, take all of this with a grain of salt. If you’re a pro or have more insight into a specific aspect, I’d be more than appreciative if you contacted me for corrections, hints etc. For all of the following to make more sense, let’s do a little ground work. The journey the sound takes goes something like this: The podcaster’s voice is going into a microphone. That signal needs to get amplified. This might happen in an interface (in its microphone preamps). The signal then goes into a PC where some recording software – DAW (Digital Audio Workstation) – picks it up. Then some post processing happens, maybe some cutting, a file is exported… and a podcast episode is born! There are many variations to this. But essentially, that’s it. Long story short: I record 24 bit. 16 bit are probably enough though, Paul argues. In my humble opinion: If this is what you’re arguing over, a) your podcast sounds perfect or b) there’s bigger fish to fry. Don’t worry about it for now, I’ll come back to it later. And the Hz? To my knowledge, there is no practical benefit to recording more than 44,1kHz. Before considering gear, let’s take a moment and think about what the goal is in the recording stage. Compared to everything there’s to think about later, it’s fairly straightforward. Best way possible in recording terms means as loud as possible, but not too loud. Okay. too loud means clipping, which means distortion. Which you don’t want. Therefore, in order to protect against clipping, which means the signal exceedig 0dB, you need some headroom. -6 to -12 dBFS as maximum signal level is recommended. Wikipedia explains what dBFS means. My understanding: It specifies the digital range of levels. Since every speaker (and every microphone) is different, this of course means that there’s just no way to figure it out in advance. A good way is to just have every speaker talk for a bit. What I imagine must be hardest for non-pros is to be careful enough. I bet the more professional you are, the more you keep the level on the quiet side. Two factors: People tend to get more excited during a conversation than during test sentences. And: clipping is worse than a recording that’s too silent. The sad news here is also good news: There’s nothing like experience. And experience might come in the form of simply more and more recordings with the same speakers. If you’re recording the same group of people, just iterate: Write down the levels you set, and after the recording check the files and look at the max levels with some kind of meter. You’re looking for the “True Peak” reading. Let’s worry later about what exactly this means. If you notice clipping during the recording (usually a red light on whatever recording device you’re using) save the current recording and reduce the levels. This is “a little hot”, as the pros say (I think). -5 is just okay, but -2,5 is pushing your luck. But, good news: This is not a failed recording by any means. I’m not giving the recording levels I use, because they’re meaningless for everybody but me in my exact recording setup. But: Depending on the type of microphone you use, the right setting might be 90-95 or even 100% of gain, so don’t be afraid to go there. This is mostly derived from this article: Noterepeat.com: Gain Staging 101 – How to get a clean loud signal. Consider the room you want to record in. Think about a bathroom, or some noisy restaurant: The less fabric and the more hard surfaces there are, the more echo you’ll have. This is bad for podcasting. You don’t need to build a sound booth though, just consider some things and you’ll do fine. Ray talks about the room specifically in this video. 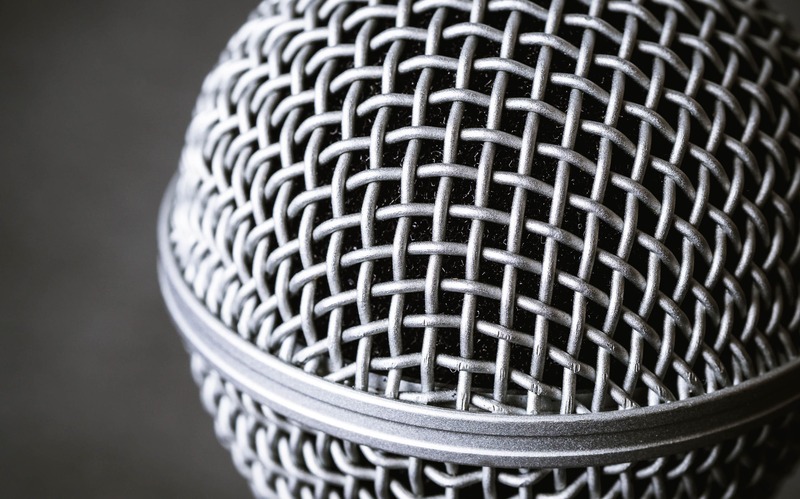 Take some time to consider how to speak into a microphone. It’s not as easy as it seems! And once it’s easy, it’s not easy to be really consistent. I really like this post on transom.org. It says it’s about “plosives”, but covers a lot of ground. Don’t vary distance or position of the microphone relative to your mouth throughout the recording. You’ll have enough variation in volume to deal with simply from being more or less excited while talking. The previous doesn’t apply if you laugh loudly, or scream: For these instances, try to train yourself to increase distance to the microphone so that the recording doesn’t clip. It’ll absolutely still come across in the recording, don’t worry. While you record, you should monitor what you’re capturing. It could be argued that once the proper input gain is set, there’s no need for that – but you’re on the other side of that argument once you discover that you’ve captured a high pitched noise with your signal in that otherwise exquisite one-hour conversation. For checking what you’re recording, honestly any pair of headphones works as long as it’s not letting through too much sound. But you need monitoring headphones anyway, for editing. What is different about monitors compared to “regular” headphones? Well, monitors are meant to be neutral, not color the sound themselves. If you like all of your music with some extra bass, you dial that in on your receiver’s EQ. But imagine an audio engineer would do the same while mixing/mastering. Everybody but her would receive an end product mixed with too little bass. This goes into mixing and mastering as well, but this much I’ll say here: Remember that you’re producing your podcast to be listened to in any situation. Over a car stereo, through earbuds on a train, through a smartphone speaker turned up all the way, anything. You can – and should – still make decisions on what your podcast should sound like, absolutely! But those can’t be based upon one level of indirection – namely your favorite headphones for listening to EDM. I went with the widely recommended Sony MDR-7506 and haven’t regrettet that decision. Maybe one thing: The coating of the ear cushions “dissolved” after some time. Other than that they’re solid. I’ve had them for years, haven’t treated them carefully, and they show no sign of wear. Aaaaah, microphones. The never ending topic. Good news: It’s not as complicated as you might think from all the talk. Marco’s guide is the best place to start. 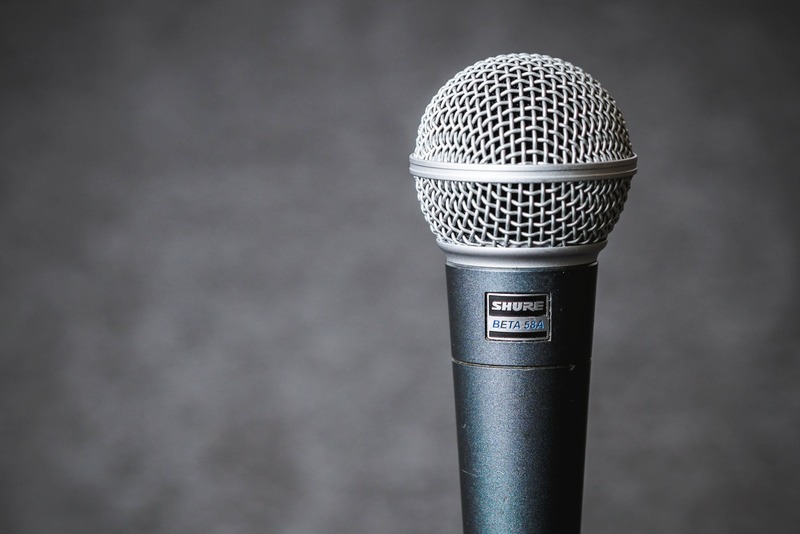 There are two basic types of microphones, condenser and dynamic microphones, and it’s good to know the basics. Others have written everything there is to write about this and how it’s relevant for podcasters: Marco’s take is as good as any. Both dynamic and condenser Microphones come in the USB and the XLR variety, Marco also writes about this. Quite some time ago I made a little video in which I recommended the Blue Yeti. It’s quite popular (the Yeti, not my video), and it’s the Wirecutter pick (for USB microphones). But: I was wrong. It has nice sound (because it’s a large diaphragm condenser microphone). But if you’re not in a studio or don’t want to build a pillow fort every time you’re recording, rejection of room noise and echo becomes an important quality in a microphone. The Shure SM58 is a solid microphone for podcasting. It doesn’t sound as clear as the Blue Yeti, but it makes recording two people in one room feasible with minimum effort. And it sounds absolutely more than “good enough”. Only bad thing: It does need quite a bit of gain, so it should be paired with an at least “okay” microphone preamp (either extra, or built into an interface or recorder, more on that later). For 100€ new, and 50-60€ used, you can’t go wrong. Beware of fakes, though. 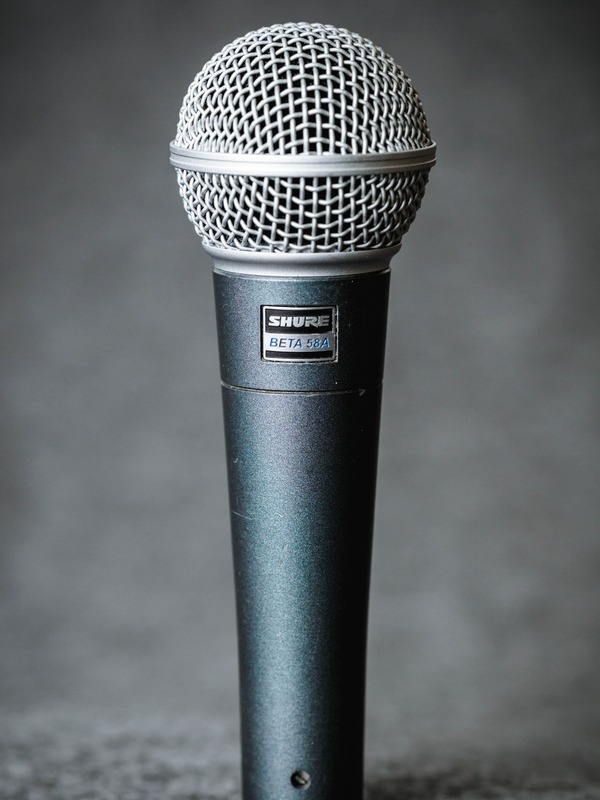 The Shure Beta 58A is an “updated” SM58, and hence also solid. Beware: It’s not necessarily better than the SM58. Depending on voice and microphone technique of the speaker, the sound characteristics (more high end) and more directional pickup pattern may or may not be an advantage. I mainly tried the Beta 58A because it offers more gain than the SM58, about 4 dB – what I didn’t know was that the signal-to-noise-ratio is the same as the SM58’s. So the noise got louder with the signal. I still like the Beta 58A for my voice, though. For 175€ new, and 80-140€ used, it can absolutely be worth it. Beware of fakes as well! 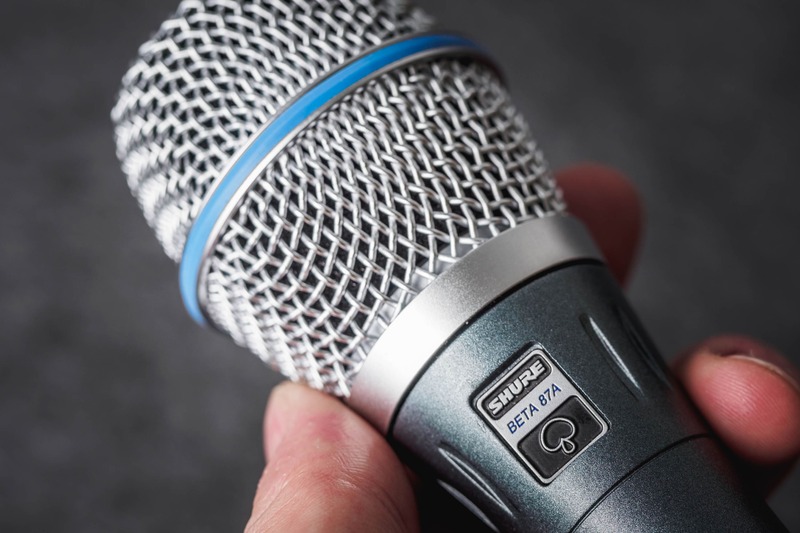 Right now I’m using the Shure Beta 87A, which is a condenser microphone – pause for effect – but allegedly with the good characteristics of a dynamic microphone! This I can corroborate. The rejection is great. When you turn your head, the drop in volume is tremendous, which also means less opportunity for nasty room echo to get in there. I wasn’t immediately impressed by the sound quality. I guess I expected Blue Yeti-level clarity which the 87A probably can’t deliver because it’s a small condenser(?). But it does sound “nicer” than the 58s. What I found curious is that it also needs almost as much gain as the dynamic microphones. Overall, I’m not totally overwhelmed by the Beta 87A, but still think I’ll keep it. Or at least use it for some time to really get used to it. For 300€ new and about 220€ used, this is not a win as clear-cut as I’d like it to be. If an USB microphone is for you and you’re in the US, the Audio Technica ATR 2100 seems to be a tremendous pick as well as a great value. In Europe, you can’t get it. But it’s supposed to be the same as the EU-available Samson Q2U. I have no experience with these microphones, so I can’t speak to them. And with the EU version, the deal isn’t quite as great. The sound has to be recorded onto something. This is either your PC, or a digital recorder. Let’s focus on digital recorders. They’re great. With a digital recorder, your podcast setup can become mobile! Besides usability and some ruggedness, for podcasters the most important property is how much noise the preamps generate. Especially if you use a dynamic microphone microphone, there can be significant noise introduced with all the gain that is needed. In podcaster circles, people recommend the Zoom H6 oder Zoom H5. In my opinion, those are not suited for podcasters because there’s no real use for the built-in microphones. The budget that goes towards those can’t be spent on better internal preamps without having a more expensive product: The H5 is 280€, while my recommendation is 170€. My recommendation, you ask? I like the Tascam DR-60D MkII. It has two XLR inputs, a built-in limiter (lessens the impact of clipping), quite okay preamps and is just solid. Don’t get confused by the labeling as a recorder for DSLR cameras. It’s all the same thing. If you’re wondering: In my tests, the preamps in the DR-60 are roughly equivalent to the ones in the H5, which are said to be identical to the ones in the H6. The 60D MkII, again, is 170€ and a very suitable (temporary) home for your audio files. If you need more inputs, the DR-70D offers that and besides that the same as the 60D. I don’t have any (but would like some) experience with the SoundDevices Mixpre-3, but they’re not really available in Europe and… “kind of” expensive. Just in case you were wondering if there’s something better: With audio, there always is. 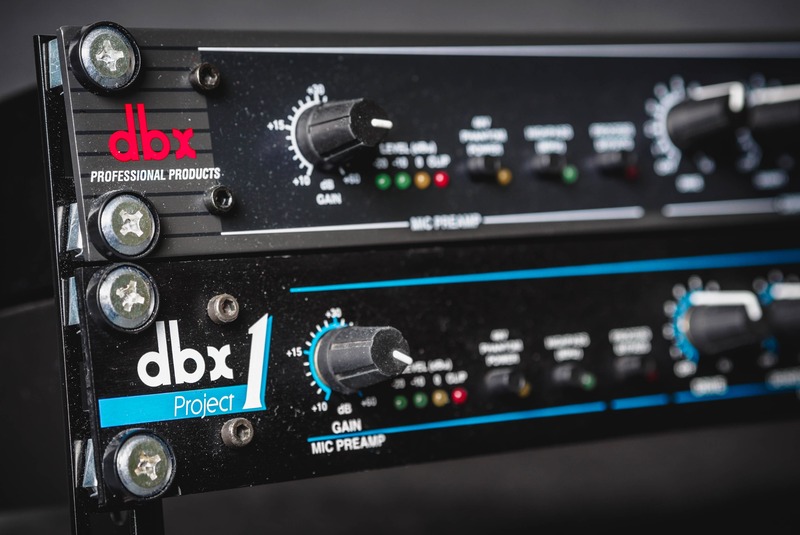 If you decide to go the XLR route and want to record onto your PC, you’ll need an interface. 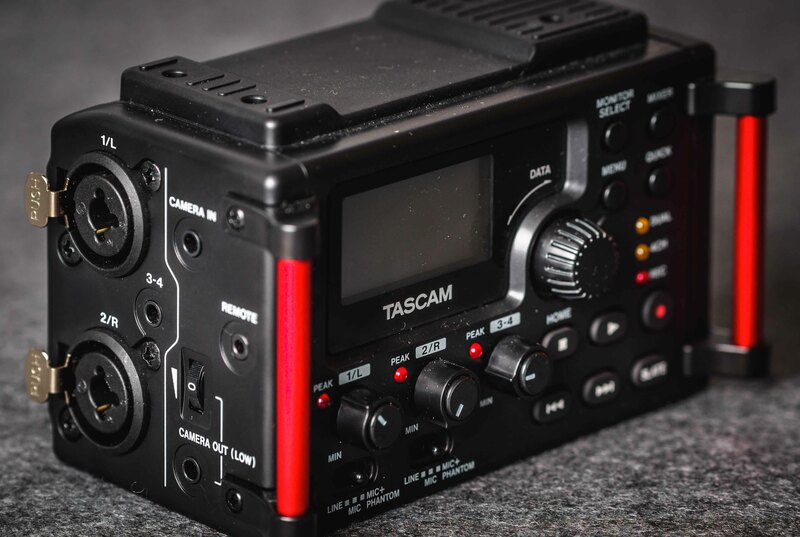 Hands down, I think the Tascam US-2x2 is great. Jason thinks so too, as well as the Wirecutter. Who’d be arguing against this? It’s 125€. A little more color on the US-2x2: The microphone preamps are one class up (“Ultra-HDDA”) from the ones in the DR-60D MkII (“HDDA”). As an interface connected to your PC it’s not as portable. Have your priorities in order and make a decision, both are great picks. If it fits your room at all, I recommend mounting your microphone on a stand. The Røde PSA1 is nice, but not suited for lighter microphones in my experience. I’m happier with the K&M 23850, but only after modding the thread that screws to the microphone holder. The piece of metal that holds the screw is just wedged in between two non-circular pieces, making it not react well to little adjustments. I fixed it with two shims. 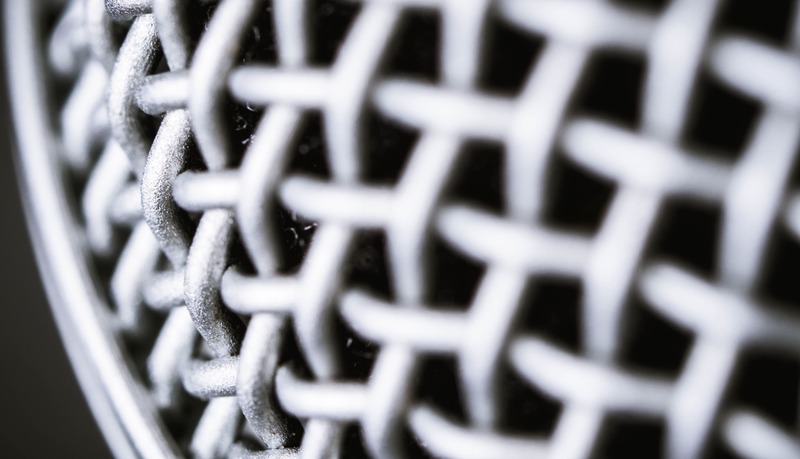 From full-on DAWs to some nice little apps, there’s a lot that can help you in creating your podcast. I use Apple’s Logic Pro X. It’s definitely not the best tool for podcasts, but it’s what I ended up with. Further down I’ll name a few apps that fit the bill better. LPX is built for music, and it shows. But can do some rearranging to make it better suited for podcast editing. Brett Terpstra has a nice blogpost on UI Tweaks, strip silence, presets, key commands, and ripple delete(!). Chase Reeves covers some of the same ground on YouTube, I found his angle useful as well. In case you end up using Logic: Strip Silence is a great feature. It removes the area of a specific track where nothing happens anyway. This makes it very efficient to deal with gaps in a recording. Sometimes I have to chop up a sentence or even a single word – but most of the time, after applying this feature, I just move around whole sections. But: I think it’s very buggy. I always have to apply it with longer Pre Attack/Post Release-Times before it’ll properly apply the right ones. Just in case it’s buggy for you as well. The settings I use: 4%; 0,6; 0,2; 0,4. Audacity is free, and it’s very powerful. I use it for recording, and it’s fine for file conversion and all kinds of little jobs that come up once you’re dealing with audio. But, and this is a big but, for real editing it’s no good at all, because it only does destructive editing. You’re going to be sad when you apply some effects, edit a whole episode and then discover that you accidentally chopped up the first sentence. You’re going to have to do it all.over.again. That’s when you’ll “graduate” from Audacity to something else at the latest. But, as I said, Audacity is a versatile tool. Further down I explain how I have used Audacity as a noise reduction tool to pretty good effect. I also still use it simply for recording on my laptop. While it is not pretty by any stretch of the imagination, it allows to show big db-meters (Logic does not). For repeating tasks, like splitting a stereo wav into two mono files, Audacity sadly isn’t automation-friendly at all. Enter SoX. If you’re at all comfortable in the command line and scripting, it’s a great way not to have to do annoying repeating tasks like an animal. To save you some time in case you have the same idea as me: For a brief moment I thought I found the silver bullet – SoX also offers noise reduction! But only nominally. Artifacts upon artifacts, not usable at all. More on noise reduction later. I’ve only used Audacity and Logic Pro X, so I can’t really speak in depth about other software for podcast editing. But I want to mention them to give you a jumping off point. GarageBand, free with a Mac If you’re on a Mac, there’s no harm in starting out in GarageBand. Check out Jason’s post on (editing in general and) GarageBand vs. Logic. Reaper/Ultraschall, 70€ Reaper always comes up, and probably for a good reason. While it doesn’t look especially beginner-friendly, it packs raw power, and there are tons of tutorials available. There also is the Ultraschall project, which makes Reaper much more suited for podcast production. Ultraschall comes from a mostly German crowd, so most of it is in German. But! More and more seems to be happening in English as well. Hindenburg Journalist, 85€ Hindenburg is also mentioned often, definitely built with podcasters in mind and offers nice features. Adobe Audition, 24€/month As well as Logic Pro X, it’s probably a bit overkill for podcast editing. But it has decent noise reduction built-in, so that’s something. The subscription price is really steep for non-professionals, though. Whatever software you end up using, take time to get comfortable with it. I found that many, many aspects of podcast production are repetitive. This means they should either be automated, or if that’s not possible then at least handled in the most efficient way possible. So using templates, keyboard shortcuts and any other feature that saves you from repetitive manual labor is crucial. For Logic Pro X, I already mentioned (again, check out Brett Terpstra’s post) Templates, Strip Silence and Ripple Delete. This last one sadly may not be feasible if you are working on more than three tracks at a time. This one’s totally up to you. How much you want to craft your mono/dialogue, how many “um”s you take out – it’s your decision. Successful podcasts are found in all varieties, from three-hour ramblings to tightly edited 20 minutes. I talk about methods, hard- and software in this post. But once you arrive at a setup, the editing is where most of the time goes. While everything else is important for how your podcast sounds, the editing brings the content in shape for a really good listening experience. I spend 2-4 hours per episode, and a considerable amount of is listening through and straightening out the conversation. “Um”s, fillers, false starts, sentences that go nowhere, chop chop! This inevitably also has to do with me and my co-host not being professionally trained, not talking into microphones for a living. But then again, who does? You may go for “less editing”, and more power to you. One word of advice though: While I support the idea that not everything has to be crafted to the n-th degree, you’re asking your listeners for their time. In my opinion, you should have an awareness of that. If you think the appeal of your show is your raw, unedited personality – better make sure that’s really the case. My point is that, when in doubt, you should be a ruthless editor. Oh boy, mixing. It’s not as hard as you think. But it’s also far from trivial. You probably need to do less than you think. But to get it rightish, it might take some failed experiments. But it’s also fun. Some wise words: For audio goes the same as for any kind of production. If you can get it right in camera/during the recording/capture of any kind, it’s (almost) always much more elegant to do so. Just because digital capture allows for some remarkable post processing, don’t rely on it. A good capture will result in a better product earlier in the process – and also give you even more flexibility in post. So, keep coming back to the basics until you’ve nailed them: Record one track per speaker (okay, you don’t need to come back to this one a lot), reduce background sounds, reduce room echo, get a good signal level, improve microphone technique. I wish someone had told me about the difference between mixing and mastering earlier. Short version: Mixing ist what you do to each recorded track individually to get the most out of it, processing-wise: Noise removal, EQ, compression etc. for podcasts. Mastering is what is done to the whole production to make it coherent. Since these terms come from the music world, in mastering the loudness and sound of the tracks of a whole album are considered. For podcasting, I’d say this mostly manifests itself in consistency from episode to episode in terms of loudness. I’ll talk about effects I use in the order that I use them in. Even though most of this happens digitally, the order is not arbitrary at all! The signal changes by each effect. Depending on the particular effect, its behaviour and/or effectiveness can be altered dramatically by how the signal was processed before. So what’s the principle to go by? The philosophy is as follows: Get rid of unwanted sounds early in the chain so they don’t come back to bite you when the signal is fed into the next effect. For example: Imagine there are high frequencies that you might want to reduce using an equalizer. Why have the signal go through a compressor before, where these frequencies may lead to unwanted results? An even simpler example: Noise reduction is something I always put on top. It just doesn’t make any sense to let all the other processing react to the noise that I want to get rid off anyway. Don’t worry if you’re confused. It’ll come to you naturally once you’ve grown more comfortable with different kinds of processing. Randy Coppinger talks about stacking order in this brilliant episode (mainly on compression, that section’s further down) of The Podcaster’s Studio from 52:40 on (Overcast timestamp link). Remember what I said about getting a clean recording? Well, that’s the goal. However, I haven’t come across a non-professional setup that doesn’t introduce hiss. Some might find “some” hiss not that noticeable, or at least for them it doesn’t warrant whipping out the noise reduction tools. Practical tip: If you know what kind of noise you’re dealing with while recording, a good practice is to get a few seconds of just that pure noise while recording. 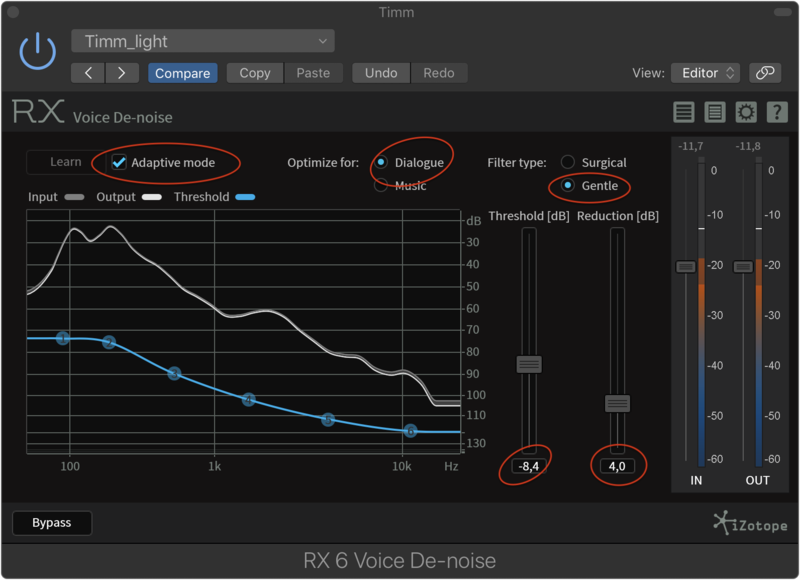 Noise reduction plugins work in different ways, but the tradeoff using them is always the same: Get rid of as much noise as you can without muffling the signal or introducing artifacts. Remember: You always risk taking away too much from the original signal, introducing artifacts. So, when in doubt: do less. iZotope’s suites seem to be the industry standard for noise reduction… for some reason. Okay, I was probably doing something wrong, but I found it to be lacking compared to Audacity’s NR. I had to be fairly aggressive, crank up Threshold and Reduction quite a bit, still had noise and got more muffled voices. Who knows – maybe Audacity’s NR is just so good, despite it being free. But I don’t want to be purely negative: Since iZotope offers real “grown up” software, their Voice De-noise comes as a plugin (as well as part of a standalone app). Using it as a plugin, “live” in your editing app of choice is a nice perk. Instead of making all the decisions at the beginning and being stuck with them, it allows you to tweak the settings as you go. In my experience, using the Learn function doesn’t offer any benefit. But the almost set-and-forget nature of the Adaptive Mode is nice. For a starting point, the settings below are what I now use for some very gentle denoising added after another kind of denoising (Brusfri, read below). Much more satisifed I am with Brusfri. It works in a way that lends itself well to continuous noise like hiss or hum. Which I have to think is what most podcasters are dealing with, right? I was really blown away. You have to feed Brusfri some pure noise since there’s no auto/dynamic microphone mode, but boy does it work. In my experience, there is minimum risk of producing artifacts or muffled sound. In most cases, I even reduce the threshold to somewhere between 40% and 20% and still get stellar noise reduction. Some negative: The interface is a little heavy on the hipster – which is to say it’s a little user hostile. Some sliders as well as having values readable without having to hover would do wonders to its usability. While noise reduction “cleans up” the signal itself, a noise gate opens and closes (= doesn’t let signal through) depending on the signal strength. It’s handy because it allows you to only deal with the “proper” output of a channel. But it’s easy to overdo it and end up with speech that is cut off. Just remember that natural speech is not on/off, but gets louder and quieter gradually. You only want to cut off the signal when there’s nothing of the speech left in it, not just after the loudest part has gone by. Let’s go over the most common settings of a noise gate. Since every recording setup and situation is different, most concrete values I use mean nothing. But, since most of podcasting shares the use of human voices, I’m still referencing them to just give a ballpark. Reduction: The amount/degree to which the gate closes. You probably need less than you think. The goal of a gate is not to eliminate absolutely every sound in between speech, it’s just to have a nice separation between the important and the unimportant stuff. Attack: How fast the gate reacts to the signal passing the threshold. For speech, it probably doesn’t need to be as fast as 5ms, because our voices need some ramp-up. But I also don’t see how a fast Attack hurts. Hold/Release: For speech, I can’t philosophically see Hold and Release as separate values. A Hold of 100ms in isolation is probably too short, but since speech doesn’t keep on ringing like some instruments do and stays above the Threshold, it works in conjunction with a longerish Release. I think a Release of up to 400ms also worked well for me. High/Low Cutoff: This is crossed out because it’s basically two equalizer filters that creeped in Logic Pro X’s noise gate plugin. Equalization is used to suppress unwanted aspects and enhance wanted qualities of a voice. Reducing some boominess or a nasal tone, push the high end a little – voilá, the EQ is your friend! I find using the EQ well probably harder than it is, but boy… it’s no walk in the park for sure. Lucky us, there’s great resources out there for EQ as well. First and foremost: Ep. 87 of The Podcasters’ Studio with Rob Williams (Overcast link). The exact EQ Cheat Sheet Ray and Rob talk about seems to be no more, except for in this screenshot. But Rob has a new thing going: How To Eq Vocals. Keep in mind that this specific tutorial – and most you’ll find – are aimed towards EQ for vocals in music, not for spoken word in podcasts. The more broad a lesson is, the more it’ll apply. Use your best judgment in implementing specific techniques. Breaks. This goes for all kinds of audio work, but especially for tweaking EQ: Take lots of breaks. Give each tweak some time. Be gentle. Dynamics compression in podcasting is done to improve intelligibility. It’s an important tool to reach a more even volume on each track. Why is that important, as long as everything is loud enough? Well, it’s not fun to listen to voices of constantly changing volume. This also goes into the topic of loudness standards, but more on that later. Just keep in mind that compression is about reducing the dynamic Range, the gap between the loudest and quietest part of a given signal. It takes some mental pull-ups to wrap your head around the concept. I’ll give a short explanation a go. Compression somehow is associated with raising the volume of the signal. This is wrong – but only kind of. What compression does is leveling out the signal. The signal that exceeds the Threshold is knocked down by a certain amount. That amount is defined by the Ratio. So far, the loudest parts of the audio got quieter. This means that the dynamic Range is reduced. After compression, typically some Makeup Gain is applied. The now “smoothed out” signal as a whole is turned up by a certain amount. This is where compression gets its false reputation from. Threshold: As a starting point I suggest – some mixing pros might want to kill me, but I had good results – 6dB below a track’s total RMS level. Pow! Sidebar: RMS is a kind signal level reading. It’s a “more average” (that’s the technical term!) representation than a pure peak measurement. Ratio: Totally depends on your approach/taste/needs. You could start at 2.5 and take it from there. For illustration purposes I’ll recount an example Randy gave in the episode: You can combine a rather low Threshold with a low Ratio. This results in Compression that will be active more of the time, but more gently. You could also combine a high Threshold with a high Ratio. This way, the compressor only reacts to the very loud parts of the signal, but then really slams it down. Attack/Release: For speech, auto settings tend to work well if your compressor plugin offers them. Other than that, a fast talker warrants a fast Attack (somewhere between 10-15ms). A typical Release might be somewhere between 20 and 80ms. Peak vs. RMS: If you can set whether the compressor reacts to peak or RMS (in Logic, that’s hidden in the “Side Chain” menu) the latter makes more sense. Except if for the one part of the track with excessive laughter, you want to use a compressor as a limiter and punch down those really high peaks. It’s hard to believe, but in mixing there are no hard and fast rules, and there are many philosophies to try and choose from. Makeup Gain: This setting is applied to the whole signal. What one could aim for here is the average reduction that is caused by the compressor itself. Why? I think because the headroom you gained by reducing the “overly” loud signal can now be “spent” on raising the whole signal. BUT you can also leave the makeup gain be and use a separate gain adjustment later. 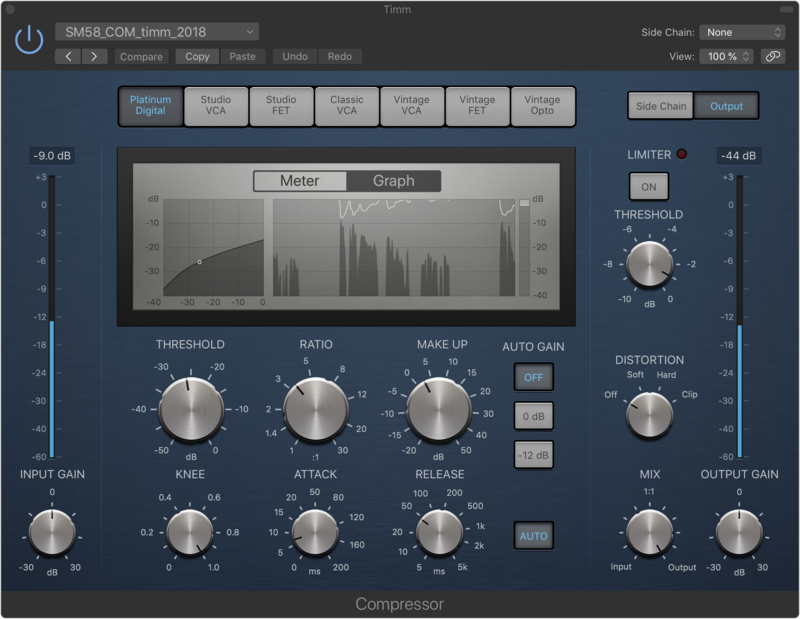 Limiting is basically the same as compression – only viewed from the “other side”. It’s a basically a compressor with an infinitely high ratio that slams the signal down once it reaches the set threshold. While you can definitely use it in the mixing of each track, it’s more of a mastering tool I think. It’s a way of making sure that nothing exceeds 0dB. Important to know: A lossless file, like a wav from your editing suite, will peak exactly where it “should”. If you limit to -1dB, the .wav will peak at -1dB. But nobody distributes their podcast as .wav, because that’d be ridiculous. Once you convert to a lossy format like mp3, there will be higher peaks. This has to do with the way data compression works: There are simply not as many data points, and by “jumping” from one to the next, there can be higher peaks than in the original file. For this reason, once you talk limiting, it’s common to not use dB = decibel, but dBTP = decibel true peak. A dBTP value is arrived at by simply oversampling the signal, usually 4X. So, if you limit at the master stage, definitely set everything you can to dBTP. How much higher the peaks will be depends on the amount of data compression (how lossy the final mp3 will be). You want just one value? Okay, -2dBTP are considered safe for most applications. Don’t worry about the “loudness compliance” part for now, we’ll get to that almost immedialtely. Logic Pro X’s limiter plugin is… “a little weird”. In order not to produce a limited but also quieter signal, you have to “add” gain that matches the negative output level (Thank you Paul!). Release and Lookahead – Sorry, no insights from me here. I just use the settings that Paul recommended for mastering voice, never had a problem with those. Just remember that True Peak setting. I use -9.5dBTP as output level here, which has to do with – you guessed it: loudness. Limiting is important enough for any production, but all of this becomes more important and interesting once we talk loudness standards! From designers (who already tend to be very nerdy) I sometimes hear that typo nerds are really the crazy ones. I think the same applies to podcasters and then those who proud themselves on adhering to loudness standards. when folks listen to podcasts on a mobile device, they are likely on-the-go. Commuting via metro […], bus, walking, whatever. Or they are listening while doing the dishes or driving in the car. All of these scenarios will have loud background noise that competes with the audio. This fits with what I already talked about regarding compression and how it helps intelligibility. It is kind of a prerequisite for a coherent production that is loudness standard compliant. Loudness standard? This is where the whole loudness thing goes a little further. The goal is not only that every podcast is “loud enough”, but that audio of the same kind is of equal loudness – across the board! No hastily reducing the volume because the next show’s intro makes your ears hurt – a real utopia, but we’re getting there. For this purpose, there needs to be a way to measure “loudness” as well as a standard everybody aims towards. There have alway been meters in audio, but for a long time there was no objective way to measure “loudness”. Peak amplitude or even RMS are measurements, but they are based upon the energy within a given signal. This doesn’t correlate to how loud a program is *perceived by a human ear. This is because our ear has a built-in equalizer, doesn’t have the same response to different frequency ranges (babies crying, evolution and stuff). The loudness standard gods came up with a measurement that simply takes this “ear EQ” into account. It’s called LUFS – Loudness Units Full Scale. I bet you’re already in love with it. In the real world, this means that you can use a Loudness Meter in your DAW of choice, most have one by now. Note that using a Loudness Meter as you go is great for tweaking and experimenting. 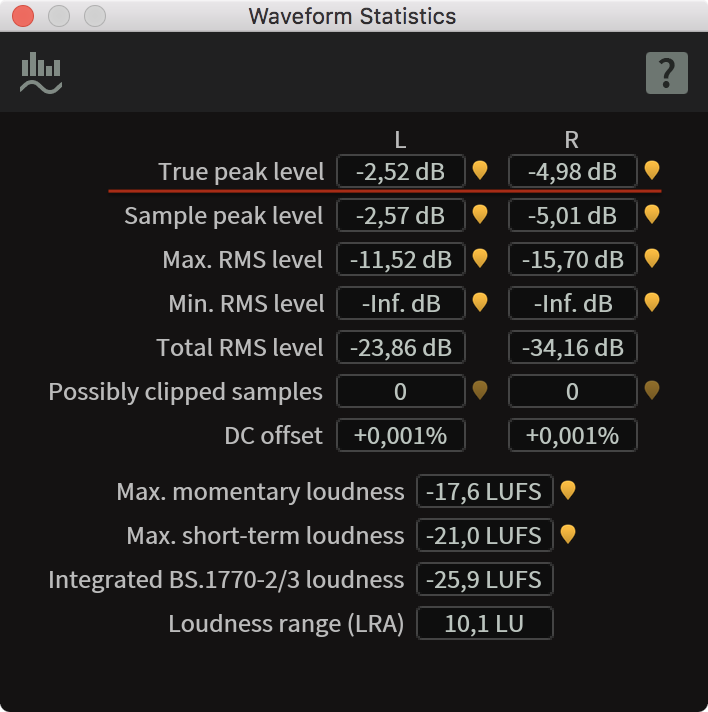 But generally, you’ll need to look at a file – or a track – as a whole, and listening through all the way just to get a loudness reading is a non-starter. “Offline measuring” is what you want, and the resulting reading is called the “integrated” loudness. If you’re on a Mac, I can recommend r128x. The iZotope suites include a “Waveform Statistics” tool that I also like. Another point of confusion might be that stereo and mono handle differently. There’s a 3dB offset: Stereo files should come out at -16 LUFS and mono files at -19 LUFS. Paul explains it. – with the last two steps being always the same, and done on the Master track. Why the limiting? Without it, the later addition of gain would almost certainly lead to several moments if clipped audio. Step 0: The prerequisite is a properly mixed file. Depending on how you used to process your audio, some more compression might be necessary. This is so that the limiting we do later doesn’t knock the majority of your signal down, which would sound bad. Besides that, this just steps is just all the processing you’d normally do, for each individual track. Each track needs to be measured (LUFS, whoop!) in order to calculate the offset to -27 LUFS. Example: If one track measures out at -32.3 LUFS, then the offset is 5.3. For each individual track, apply the offset by adding a gain effect as the last plugin. Result: After bouncing, you should end up with a file that measures at -16 LUFS (stereo)/ -19 (mono). It also should have a loudness range somewhere south of 8 LU. If you end up with a higher value, you might need to put some more dynamics compression on one or multiple tracks. You’ve bounced your project file to a nice .wav, all the work is done. All of it? Not quite. The question that every podcaster faces at some point: How many kbps are enough for my final mp3? For a long time, I’ve been in the 64kbps mono camp. “Good enough for voice”, sure! Until I went down a rabbit hole of misguided EQ tweaks that got me nowhere. I had arrived at a sound in Logic that I was very happy with. Only the mp3 had something to it – not quite compression artifacts, but also nothing that was existing in the wav file. It drove me crazy. I then finally did another comparison of 64 vs. 128kbps and heard a difference. It may be some aspect of my voice that I’m really (overly) allergic to – however, I found the sound more pleasing, end of story. Try 64kbps, and if you’re happy with it: great. If not, just go for 96 or 128kbps. Audio is packed into tiny files. People are out and about streaming 4k video, for F’s sake! I always found including chapters a hassle. Until all-things-podcast-Marco released Forecast publicly. Try it, it’s fun! Forecast also makes all the tagging and naming a breeze, derives episode names from your folder/filename structure which is very clever and works great. A word regarding chapters: mp3 chapters seem to only have a “resolution” of full seconds. If you’re really particular about people jumping right to the middle of a word, consider this while placing markers – or move the audio around a bit. Me and my cohost are fast talkers, a little more space between sentences generally is a good thing anyway. Forecast also allows for very convenient addition of chapter images. I can’t come up with a reason why you shouldn’t use Forecast for finalizing podcast projects. Even the very final step, podcasters argue over. Just make your project an mp3, right? Not so fast! Enter the dithering problem complex! If I’m going from 24 to 16 bit, something needs to happen to that extra information that doesn’t “fit” in the 16 bit file. If not handled properly, the distributed 16 bit file can sound (probably inaudbly, though) worse than one recorded at 16 bit in the first place. If you are, as any sane podcaster is, distributing an mp3, I’m not so sure. The LAME encoder for example internally works at 32 bit. So I can’t fathom why you’d need to go “down” to a 16bit wav before feeding the file to LAME. Just feed the encoder the best file you have and let it worry about the rest. Do your editing, mixing etc. Not quite a tool exporting, but promoting: The folks at NPR released an Audiogram tool. With this, you can create a video file out of a snippet. Great for promoting an upcoming episode on social media. Whatever you do, don’t host on SoundCloud. Its future is uncertain, they hide your mp3s from you, and even with a paid plan you haver very little control over your feed/files. I use Simplecast. It’s pretty solid I’d say. They could make the included website a little more customizable and finally come out with more detailed statistics. But overall im pretty happy. Their customer service is responsive, overall they strike a good balance between customizablity and usability, and they can put you on Spotify! They also offer a snazzy embeddable player that I’m using later in this article. I bet you also don’t go wrong with choosing Dan Benjamin’s (of 5by5 fame) Fireside.fm. The omnipresent (as podcast advertiser) Squarespace also does podcast hosting – but you have to twist its arm a little bit to get there. I remember quite some forum-hopping and hassle to have everything just-so for my old podcast. Also: the last time I observed a friend set up her website on Squarespace, it felt a little like… I’m gonna say it: Wordpress (if you don’t know Wordpress: It’s powerful, but boy is it ugly and hard to use). There’s also libsyn – big podcasts use it, I’ve heard only good things about it. But I have no idea how well suited it is for smaller endeavours. You know what’s fun? Taking everything you’ve learned and throwing it out the window. Not really of course, because that knowledge still comes in handy. I felt a little weird though, “transferring” some/most of the stuff I did in Logic to a box that I plugged in between microphone and Interface. Sorry, I’m getting ahead of myself! If you feel fancy or adventurous or both, you can do what radio stations or streamers do: Do most of the post processing… well, during recording. There’s a risk: If you screw it up, the recording is screwed up. Philosophically, I’d be totally opposed to this. But the upside is a reduced amount of work after the fact. My post processing now consists of noise reduction, loudness optimization and some EQ that I’m working to get rid of – That’s it! I went down this path mainly because I was looking for a higher-quality preamp, but now I’m in love with recording a nicely compressed signal. 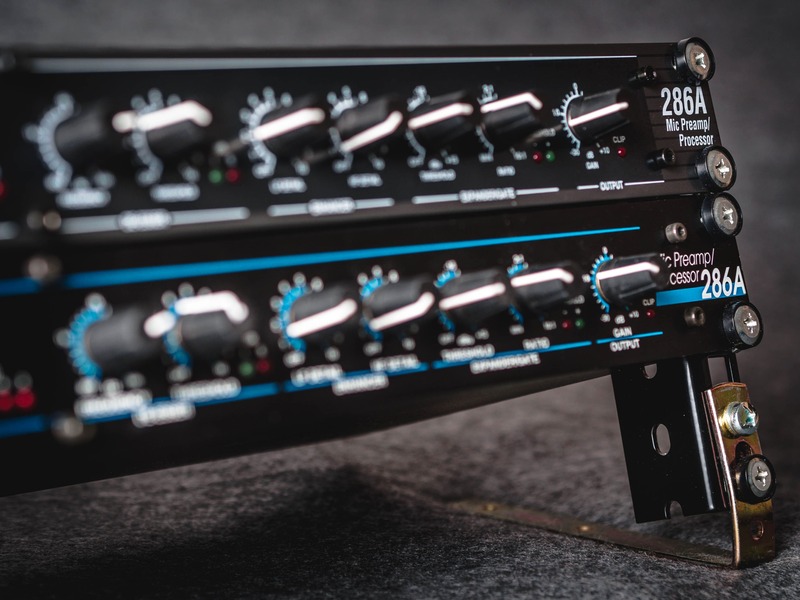 If this sounds like it might be for you: You might want to take a look at a dbx 286. It’s a dedicated microphone preamp that also does processing – very well suited for podcasters. It does compression, de-essing, some EQ, and some gating. Sure, 170€ per channel is nothing to sneeze at for a hobbyist. But you can get good deals on a used predecessor model (I got one for 30 bucks. 30!). A word on the different versions: The dbx 286A seems to be almost indistinguishable from the current model, the 286S. The 286 (no A) has an external power supply. There’s also two versions of the 286A: with “Project 1” labeling and without. The Project 1 version seems to be older. If anything though, it produces less hiss on the highest gain settings than my “regular” 286A. 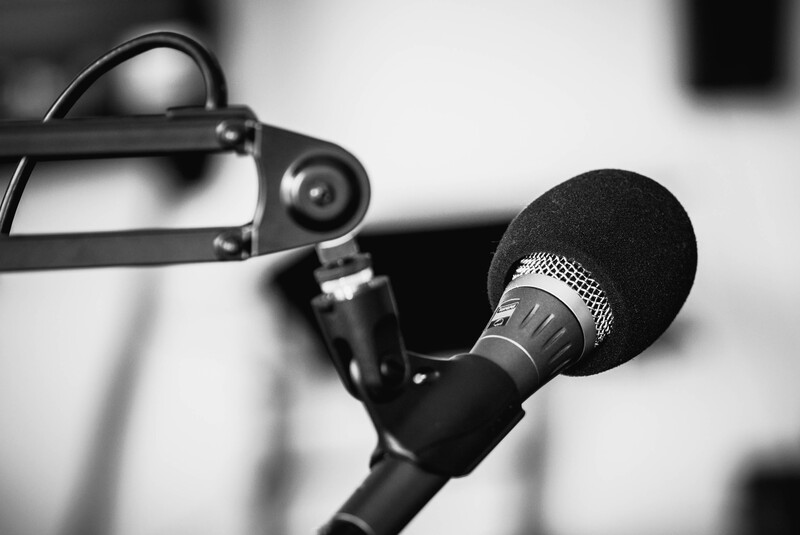 Episode 101 of The Podcasters’ Studio – A guide on how to start a Podcast. Okay, you’re beyond that if you’ve made it here, but it’s a good reminder of what the basics are. Jason Snell – I’ve bugged Jason via twitter several times, and he was always very nice and helpful. Before Forecast was public, I was able to hack together a script that generated podcast mp3s – something that only seamed feasible because I tweaked a script of Jason’s. If you do podcasting and hit a problem Jason has written about – maybe podcasting on iOS? – you’re definitely in luck! All of Jason’s writing on podcasting. Ray Ortega – I have learned so much from the episodes of The Podcasters’ Studio I linked to in the sections above I almost can’t believe it. They’re an amazing start in their respective topics for sure. But they’re so dense that you can come back when you have the basics down and learn twice as much. Just an incredible resource. In addition to that, Ray has always been very nice and helpful when I bugged him via twitter. Paul Figgiani – I hit Paul’s website while wandering the desert of loudness compliance confusion, and it was everything I had been looking for. He also tweets about new plugins or general developments in podcasting. And when I hit the enigma-like behavior of Logic’s limiter, he took the time to reproduce my setup and present me with the solution. Marco – Well, Marco’s Podcast microphones Review is legendary by now. If this wasn’t enough, with the release of Forecast he gave all podcasters a really really amazing present. I almost forgot, he also is the developer of Overcast, many podcasters’ favorite iOS podcast app. There are even more fellow podcasters that I had small, very helpful interactions with. I think it’s great that podcasting is to a large extent made up of people who want to help each other. With this article, I try and do my part in making podcasting more accessible. Or at least in demistifying a higher production quality a bit. If you want to hear what all of this know-how sounds like, give my podcast a listen (it’s German though): Die Sonne über Altona – as I write this, there are 42 episodes released. Naturally, I think the latest episode sounds the best. If you’re wondering what our first episode sounded like, look no further. Quite a step up! I’ll even share the first podcas episode I ever did. One track, recorded on… an iPhone 4S I think. Again, if you have any input or questions, please don’t hesitate and contact me. Thank you so much for reading/skimming/being interested :) Cheers! I recently got my PlayStation 4 Pro swapped out for a new unit and a second, identical run of photo prints, both of which weren’t necessary at all. In both cases, I was in contact with customer service, inquiring about a problem. The PS4 seemed to produce faulty shadow graphics, the run of prints had a few pictures with bad color gradients. Both times I had simply asked customer service the question “Is this normal?”. Both times it seems the scripted responses or actions didn’t allow for actually pursuing an answer to that question. Instead, I was asked if I had tried rebooting the PS4, and was promptly sent that second set of prints – again with faulty color gradients. After a ton of persuasion, I got the PS4 switched out for another unit, which… drumroll showed the same symptoms. Still can’t believe this is where technology is at regarding shadow graphics – but that is beside the point. I get it: Customer service, customer support is expensive. You need scripted responses and standard procedures to manage the volume of requestst that hit your infrastructure every second. But at the point where that system leads to totally unnecessary costs and a crappy experience for the customer, you need to acknowledge that it’s just not working. More like New LOLker, amirite? 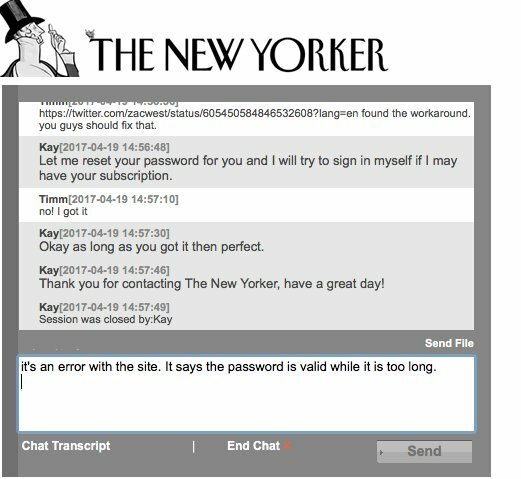 I couldn’t log in to my newyorker.com account, got a wrong password message. I guess you’ve been there, a perfect setup for a great customer service conversation if there’s ever been one. Thing was, I didn’t enter the wrong password, I entered exactly the same the form on the website had previously accepted as a valid one. But since I’m such a poweruser, I chose a password that was, in fact, “too long”, at least for the part of the website that accepts passwords. It would’ve been one of the great mysteries of technology, because the customer service got me nowhere. Huge shoutout to twitter user @zacwest for pointing the error out in a googleable manner. This was of course after the “let me reset your password for you“-dance which I had to go through again despite having explained that I had already done so. With somethiong like this, no smug realism-cutthroat-capitalist-this-is-just-how-it-is attitude can justify the abysmal quality of the vast majority of customer service experiences. Security (and that’s a big one!) aside, it simply has to be more expensive to deal with all the requests this bug generates than to fix the underlying problem. But seemingly, again, “inquiring about/fixing the underlying problem” is not a common action customer service representatives are allowed or motivated to undertake. To be clear: I am not blaming this on the individual represantatives I was in contact with. Most likely the customer service system simply rewards “successful requests” over a real, sustainable analysis of the problem at hand. A symptom of bad management/environment, not individual bad performances. I don’t want to be purely negative, and rather emphasize my point by giving a positive counterexample. A customer service issue is always also an opportunity for delighting the customer, or at least making them feel better than if the problem hadn’t existed in the first place. Theoretically, no issues with the product would be preferable, but I’d say since we’re all human, a successful interaction has the potential to make us feel special. A good friend of mine recently was dissatisfied with soup she bought in her lunch break. She wrote in, and what she got back was a) an apology b) an explanation and c) a shipment of free soups, all of which are very important. The free soup is really the extra mile, but what is the price of some soup compared to the value of a real fan of your brand?